When I first found out I was pregnant, one of my first thoughts was a concern that Rosemary would feel jealous or like she was losing time with her mom and dad. Obviously, we are going to work hard to make her feel like the top priority she always has been, but I wanted to give her something special to symbolize how important she is to me. I wanted this blanket to be able to give her snuggles when my hands were full and keep her warm and safe-feeling. 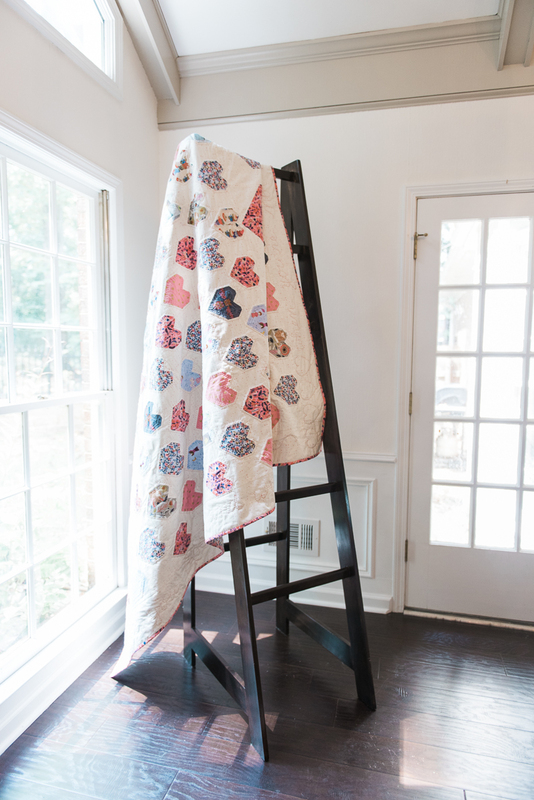 I modified this quilt pattern to make it fit a full size bed and include some larger hearts. 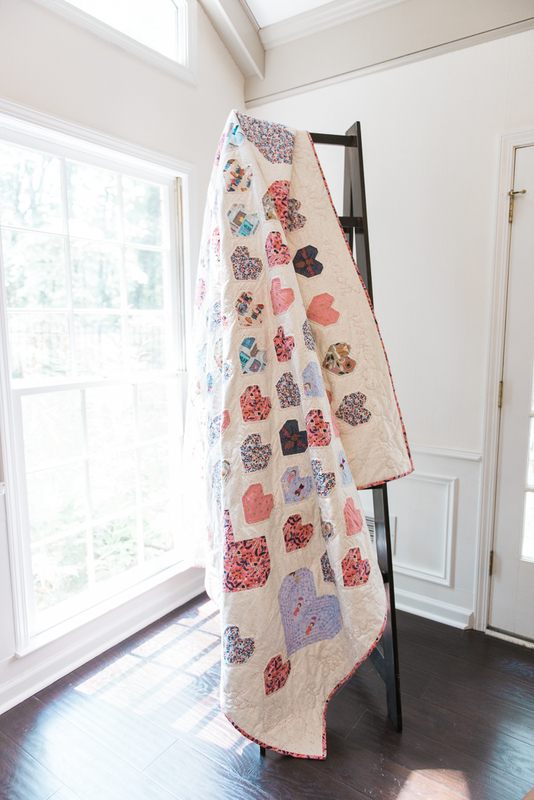 I always loved hearts and thought it appropriately showed all the love I poured into this quilt. 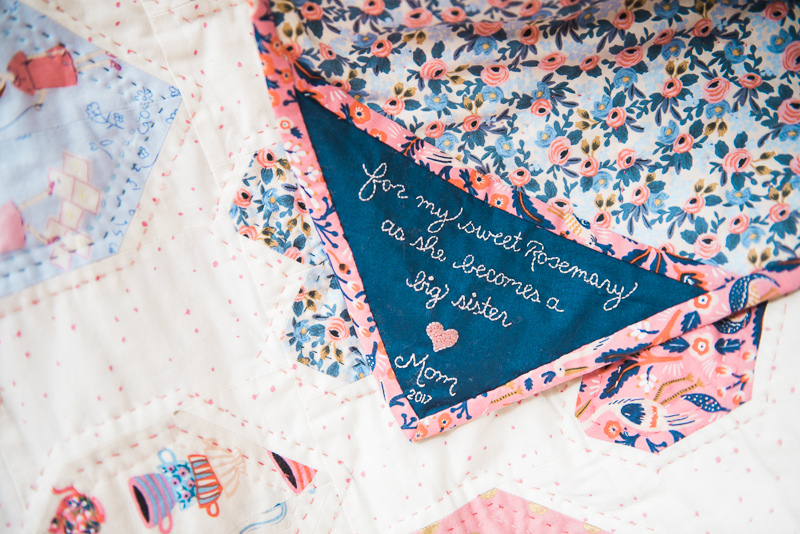 I also specially chose each fabric in the quilt to give her something to look at and study. I remember following all the patterns of my blankets growing up – the flowers, the animals, etc. In the few times she’s seen the quilt since I started working on it, she’s really gravitated towards the lions and bees. I know she’ll also love looking at the kids playing hopscotch and the books too! I machine-pieced the top of the quilt together during my first trimester and it was a REAL struggle. I could barely stay awake while Rosemary napped, so I tended to work after Chris got home and Rosemary had gone to bed. After piecing the top, I hand-quilted the three layers of the quilt together. Wowza, did that take a long time (approximately 2 months). Fortunately, it was a pretty relaxing process, and I enjoyed thinking of Rosemary tracing the stitches with her cute little fingers one day. Using five different colors of DMC embroidery floss, I quilted three rows of stitches around each of 103 small hearts. Each large heart had five rows of stitches using all five colors. I love you, Rosemary, oh yes I do. I love you, Rosemary, and will be true. When you’re not near me, I’m blue. Oh, Rosemary, I love you. Finally, I hand-embroidered a label into the corner of the quilt commemorating the occasion. All in all, it took about 4 months and 400 hours to make. I am so excited to give this to her when her little brother arrives! I thought of and prayed for Rosemary during every stitch of this process. I want nothing more than for her to grow up know how loved she is.